Inspiration comes from all sorts of places. In this case the original design came out of the planning for an upcoming ski trip to Idaho. Seeing as baby couldn't go on the ski field, clearly some fabulous après ski wear was needed for crawling around the chalet. 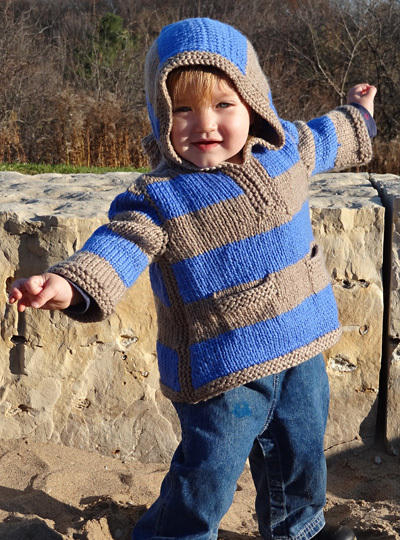 Full of great little design features, like the garter stitch side seams, and cute shaped hood this is a sweater for junior to snuggle into, once you've had the fun of knitting it. The sleeves are worked top down from stitches picked up around the armhole, with the shoulder cap shaped by short rows, and then continued in the round, to make a seamless piece. In addition, because of the use of three-needle bind-off throughout the pattern there are almost no seams to sew at the end. Safety pins or removable locking stitch markers for Japanese short rows. Instructions for the three needle bind off method can be found here. 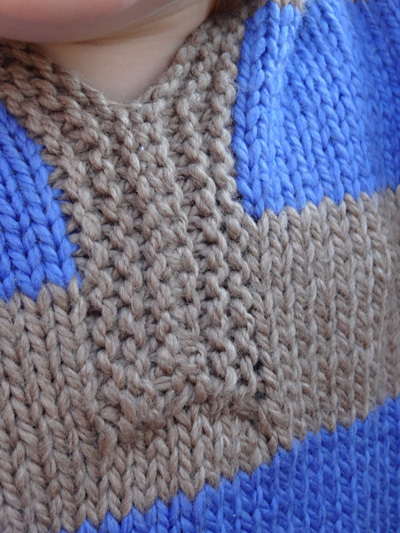 Instructions for working Japanese short rows can be found here. Instructions for making a tassel can be found here. Break and rejoin yarns when changing colors. Using Color 1 and long-tail method, CO 50[54, 58, 64, 68] sts. Break yarn and join Color 2. From here, you will work in color pattern throughout. Decrease row [RS]: K1, ssk, k to last 3 sts, k2tog, k1. 2 sts decreased. Work 5[7, 7, 7, 9] rows even in stockinette stitch, starting with a purl row. Decrease row [RS]: K1, ssk, k to last 3 sts, k2tog, k1. 2 sts decreased. 40[44, 48, 52, 56] sts. Maintaining color pattern, continue in stocking stitch until you have completed 36[40, 46, 56, 64] st st rows, ending with a WS row. Decrease row [RS]: K1, ssk, k to last 3 sts, k2tog, k1. 34[38, 42, 46, 50] sts. Work until there are 24[24, 26, 28, 30] rows from the start of the armhole. Using Color 1[1, 1, 2, 2], CO 12[12, 14, 16, 16] sts. Work in St st for 14[14, 16, 16, 18] rows, ending with a WS row. Break yarn and place sts on holder. As you work this section, maintain decreases and color pattern as set. Row 1 [WS]: P6[8, 8, 6, 9] sts, pm, k 12[12, 14, 16, 16] sts (pocket cuff), p8[10, 10, 12, 12] sts, pm, k12[12, 14, 16, 16] sts, p to end of row. Row 3 [WS]: P to first marker, k 12[12, 14, 16, 16] sts, p to second marker, k12[12, 14, 16, 16] sts, p to end. Row 5 [WS]: P to first marker, remove marker and bind off 12[12, 14, 16, 16] sts, p to second marker, remove marker and bind off 12[12, 14, 16, 16] sts, p to end. Next row: Knit, working decreases as required, to beg of first pocket opening. Ensuring RS is facing, k first pocket facing off stitch holder; k to next pocket opening; k second pocket off stitch holder. ; knit to end of row, working decreases as required. Continue working front, maintaining color pattern and working side decreases, until front matches back to armholes, ending with a WS row. Bind off 2 sts at beg of next row, k until there are 15[17, 19, 21, 23] sts on the right needle. Turn work. Bind off 1 st at beginning of next row, k to end. Turn work. 14[16, 18, 19, 21] sts. Work even until there are 24[24, 26, 28, 30] rows from the start of the armhole, ending with a RS row. Break yarn, leaving a long tail. Leave sts on holder. With RS facing, rejoin yarn to rem sts for right front. Next row [RS]: K to last 3 sts, k2tog, k1. 14[16, 18, 20, 22] sts. Work until there are 25[25, 27, 29, 31] rows from the start of the armhole, ending with a RS row. Leave sts on holder; do not break yarn. With right sides together, join left shoulder seam by binding off 6[7, 8, 9, 10] sts moving from shoulder edge to neck edge, using 3 needle bind off and the long tail from the back. Place 7[8, 9, 10, 11] remaining live front sts on a holder. With right sides together, moving from shoulder edge to neck edge, join right shoulder seam by binding off 6[7, 8, 9, 10] sts using 3 needle bind off . Turn work so right side of work faces you. Place remaining right front sts and last live st from bind off onto the right needle, so the working yarn is ready to work. Work across back of neck and remaining left front sts. 36[40, 44, 48, 52] sts. Maintaining color pattern as established in front and back, work 3 rows stocking stitch, ending with a WS row. Row 1 [RS]: K 16[18, 20, 22, 24] sts, pm, M1L, k4, M1R, pm, k to end of row. 38[42, 46, 50, 54]. Row 3 [RS]: K to marker, slip marker, M1 L, k to second marker, M1R, slip marker, knit to end of row. 2 sts increased. Maintaining color pattern, repeat last 2 rows 10 more times. Remove markers. 60[64, 68, 72, 76] sts. Continue in color pattern until hood measures 9[9.25, 9.5, 10, 10.5] inches from base of hood, ending with a WS row. Move sts to circular needle. Fold hood in half with RS together, so 29[32, 36, 38, 40] sts are on front needle, and 29[32, 36, 38, 40] sts are on rear needle. BO, using 3 needle bind off. With RS of front facing, using color 1, pick up 33[37, 40, 47, 56] sts along one side, between the start of the armhole shaping and the cast-on edge. Break yarn. Leave sts on needle. With RS facing, pick up 33[37, 40, 47, 56] sts along back right side seam. Place right sides of front and back together, and bind off live sts using 3-needle bind off. 2[2, 2, 2, 2] sts from side seam. 34 [34, 36, 44, 46] sts total. Distribute stitches on dpns and join for working in the round, marking the start of round at the center of the side seam with a stitch marker. The sleeve is now worked back and forth, with Japanese short rows, until the cap shaping is complete. Row 1 [RS]: Using Color 1 and dpns, and changing colors when you reach the start of a different color band, knit 19[19, 22, 25, 28] sts, turn & pin using the Japanese short row method. Row 2 [WS]: P4[4, 6, 8, 10] sts, turn & pin. Row 3 [RS]: K to previous turn, pick up wrap, turn & place new pin. Row 4 [WS]: P to previous turn, pick up wrap, turn & place new pin. Repeat Rows 3-4, working up to last pin placed, picking up wrap, then turning and placing new pin. Each stitch will be separated by a pin hanging to the back of the work. Change colors to match front and back color bands, until there are 4[4, 4, 6, 6] sts total remaining unknit in the middle. Begin working in the round, picking up the 2 remaining wraps as you reach them. Maintaining color pattern, work even until inside sleeve measures 5.5[6, 7.25, 8.5, 10] inches from underarm and side seam. Change to or continue using Color 1. Repeat Rounds 1-2 once more, then Round 1 once more. Using circular needles and with RS facing, beg at the bottom left of hood opening, pick up 100[102, 106, 112, 122] sts around opening. Sew together the two bound off edges of the hood trim at the bottom of the hood, so the front facing is sewn together. Sew pocket linings to insides of front. Crochet a chain 4 inches long, and use to attach tassel to end of hood. 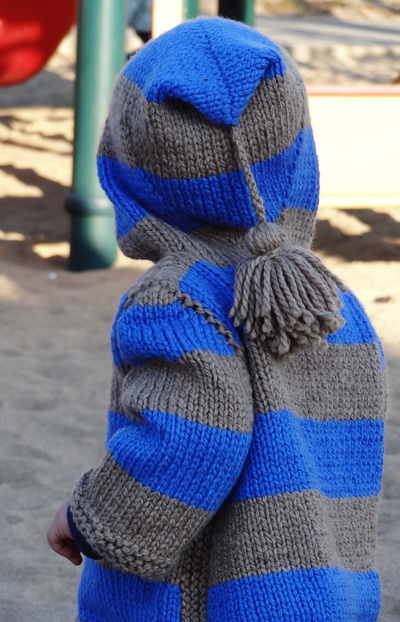 Keri began knitting when she was 6 years old, and never really stopped. The arrival of her daughter has, however, slowed her down a bit. She feels uneasy if she doesn’t have something on the needles for her wee girl. 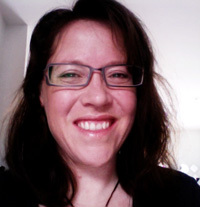 Keri can be found on Ravelry as Kiwicanuck. Ingrid taught herself to knit when she was pregnant with her daughter. 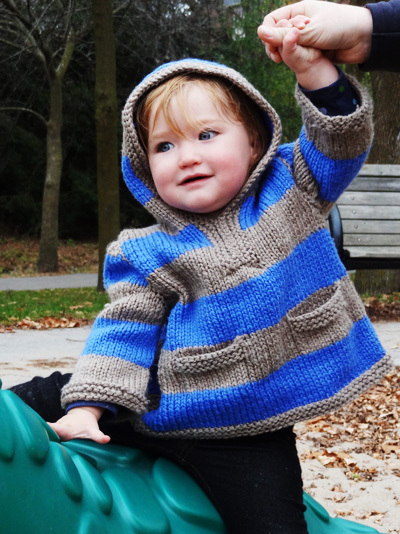 Her first project was a tiny baby sweater and hat knitted from very fine yarn and it took almost the full 40 weeks to complete. 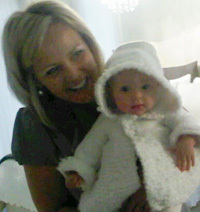 Now, since her baby girls are now all grown up, her granddaughter has renewed her interest in knitting. 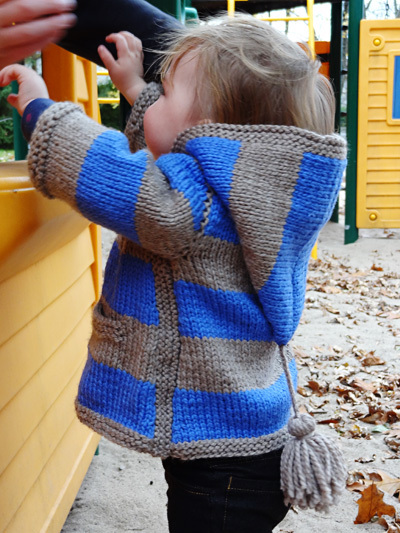 Ingrid can be found on Ravelry as Petitepearl.